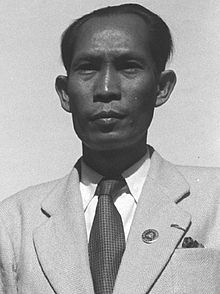 Penn Nouth (Khmer: ប៉ែន នុត, Khmer pronunciation: [paen nut]) (1 April 1906 – 18 May 1985) was a Cambodian politician. He served in the French colonial administration, then took active part in Cambodian politics, was several times Prime Minister of Cambodia (1953, 1954-1955, 1958, 1961) as part of the Sangkum regime of Prince Norodom Sihanouk. He was the first prime minister of an independent Cambodia. He was prime minister for the sixth time from 31 January 1968 to 14 August 1969. On 18 March 1970, when Norodom Sihanouk was deposed by Penn Nouth's successor Lon Nol, Penn Nouth joined the monarch in his exile and became prime minister in the GRUNK coalition. His combined tenure as Prime Minister (5 years, 222 days), spanning seven non-consecutive terms, is the second-longest in Cambodian history after Hun Sen.
After the Khmer Rouge took Phnom Penh in 1975, he served as prime minister of the country for the last time, but did not have real power; he then emigrated. This page was last edited on 27 September 2018, at 07:06 (UTC).